Spam comments are a big pain in the ***. To prevent spam comments, bloggers end up taking strict measures such as requiring people to register or have everyone enter a captcha before submitting a comment. Spam prevention controls such as captchas, math quiz, and registration makes it difficult for regular visitors to comment. By implementing one of those methods, you are punishing the wrong crowd. A lot of spam comments are generated by bots, which are programs designed to comment on blogs and websites. 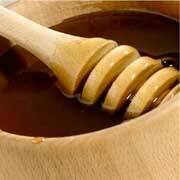 There is a common saying that you can catch more flies with honey than with vinegar. It fits perfectly here as we are about to show you how you can block spam comment bots in WordPress with honeypot. Before we talk about honeypot, lets talk about how these spam bots work. WordPress is used by millions of websites. This means that millions of websites have similar HTML output for comment forms. This makes it easier for bots to find blogs and post spam comments. Honeypot is a spam prevention technology. It tricks and traps spam bots into revealing themselves by giving them a challenge that human users can not see. Unlike other spam prevention methods which uses techniques to find out of if a commenter is human, Honeypot checks to see if the commenter is a bot. Instead of giving a challenge to human visitors, it creates a fake challenge for the bots. When bots fill the challenge, they end up revealing themselves and are caught before they could post spam. First thing you need to do is install and activate WP Spam Fighter WordPress plugin. After activating the plugin, go to Settings » WP Spam Fighter to configure the plugin. Simply check the box next to the honeypot option and save your settings. The default options should work for most websites. However we advise you to review the configuration options before pressing the Save changes button. 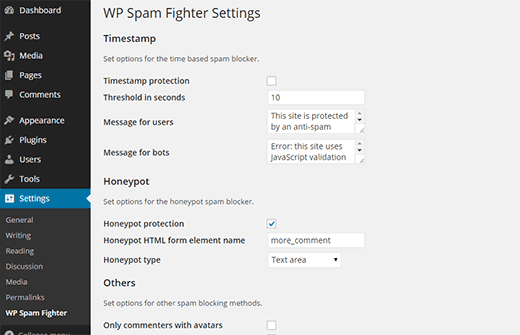 When honeypot is enabled, WP Spam Fighter will add a hidden form field into your comments area. This field will not be visible to human users, but bots will think of it as part of the form and fill it out, effectively indentifying themselves as spambots. Remember that these methods do not protect you against against manually submitted spam which is entered by human visitors. You will still have to use a plugin like Akismet to catch those. For more comment spam preventing, checkout our tips and tools to prevent comment spam. every day i got 10 spam comments. This is a good articles and i try to install this plugin but it not update for more than 2 years. Any other solution? How to find the fake Google Bots? WP-Spam Fighter has now gone for more than 9 months without being upgraded. According to WordPress it has not been tested for WP4.4. Do you still advise installing this plugin or is there something else that is more up to date and known to work with WP4.4? Hi, nice articles. I wanted to download BotBlocker plugin but I realized that It haven’t been update for 3 years. I really the idea of challenge Bots instead of Humans. Do you know another plugin that can do the same ? My Akismet is doing a pretty good job of catching the spam COMMENTS but I am bleeding spam registrations. Thank you so much for recommending this BotBlocker, it helps in stopping bot attacking my site, where there are over 79,000 of comments posted and approved without my knowledge! I then install delete all comment plugin to clear all comments. Cannot imagine what to do without this plugin to stop these bot on their track! Hi, how does this work with auto-complete tools, like the feature built into Chrome? Won’t the browser also wrongly detect the forms via their fake names and fill them in when the user chooses to autofill? Who well does it do at blocking spam comments compared to Akismet? Unlike Akismet, this doesn’t block manual spam comment. This is only for spam comment bots. Thought this would work, so I installed the plugin…….It doesn’t. The last update for Bot Blocker was 275 days ago and questions are not being answered on wordpress.org. Looks like it’s an abandoned plugin. Yep, same here. The only way I can post a comment is if I’m logged in as an admin or if the plugin is off. I’d be nice if someone here could help because the support forums seem abandoned. I wonder why articles in WPBeginners get very little comments though the article has been popular on Social media networks. Mainly because we only approve helpful comments for the most part. If you leave comments like great plugin, or great tutorial like most folks do, we simply don’t approve them. The purpose of comments is to add value (i.e questions, thoughtful opinions, suggestions, personal experience, etc). What’s the benefit with the honey pot method when Akismet will pick it up anyway? Those who self-host WP blogs have to pay for Akismet and may not want to do that. So I can use Honeypot and Akismet together with no issues?